During his undergraduate and graduate studies which were focused specifically in pastoral care, evangelism and theological training Pastor Tyron Smith found himself being well equipped to serve the Body of Christ. 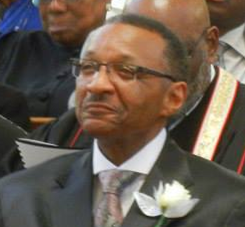 Tyron has been called Bi-vocationally by God to serve the Southside of Chicago as Pastor of Greater Mount Moriah Missionary Baptist Church and Christ Medical Center as a Board Certified Chaplain. Most importantly he has been called as one bound to witness the salvific message of soul salvation available in Jesus Christ. Tyron has made it his mission to carry this witnessing effort forth and present it with love, compassion and care that is occasioned in the Great Commandment, “Loving thy neighbor as thyself.” Looking back at his seminary experience, Tyron is deeply grateful for the training he received at Northern. Thanks to this amazing educational experience, he feels equipped to meet the challenges of our present day. Please remember to pray for Pastor Smith as he continues to live out his calling.